So, I’ve gone and done something most business-y types will tell you is a bad idea. I’ve removed my phone number from my website. Yes, this site. My business site. And it’s precisely to help my business that I did so. I am a one-woman operation here, which means I handle everything: emails, invoicing, accounting, bidding, social media, etc. Plus, you know, all of the actual design work. In the space of any given day, I already have a lot on my plate. Having my concentration and work flow interrupted by unscheduled and unnecessary phone calls is both an annoyance and a waste of my valuable time. And, sadly, I get too many of those. Marketers, sure, despite being on the Do Not Call list. I’ve even gotten a few prank calls from what I assume (hope?) are bored teenagers. But mostly just people who didn’t take the time to read my website, asking me about services that I clearly state I don’t offer. Or people (that I’ve never worked with) who have a last minute project they expect me to drop everything to take on, for a laughably small budget or “exposure” – ha! In short: people who don’t respect my time. And I am officially fed up with it. I’m not a phone person to begin with, so maybe this piques my ire more than most. But there’s also no reason I need to put up with it. Cold calls aren’t exactly a big source of clientele for me. I’m an online girl. So I’m not losing out by doing this. I’d be losing out if I didn’t do this. Aside from putting me in a bad mood, wasting time on nonsense calls hurts the efficiency of my business, and the quality of work I provide to my actual clients. Those actual clients, by the way, all have or will be provided with my phone number. I’m not cutting out the phone completely. I’m still happy to talk to current and past clients about our projects, and for potential clients I’m happy to schedule a time – via email! – to talk on the phone and then provide my number. It’s not an interruption then, it’s relevant and part of my workflow. So if you go looking for my phone number on this site and can’t find it, that’s why. And if you actually need to talk to me, you either already have my number (hello, current client!) or can email me to set up a time. And if that bothers you, you can move right along to a different designer’s site, as this is how I’m doing business from now on. One-person business sites not having a listed phone number: deal-breaker or no? For the record, I also have all notifications turned off on my phone, so I don’t get interrupted by tweets or anything like that either. So if it takes me a bit to answer your tweet, it’s because I’m working! And no, my phone doesn’t actually have a cord. It’s a metaphor, people. Thank you! 😀 Glad to hear I’m not alone, too. My website (in it’s old incarnation and this new one) has been phone-free for almost a year, and there have been no ill effects, so I’m calling it a choice well made. I think I did this on my own website all of two days before I saw you tweet this. 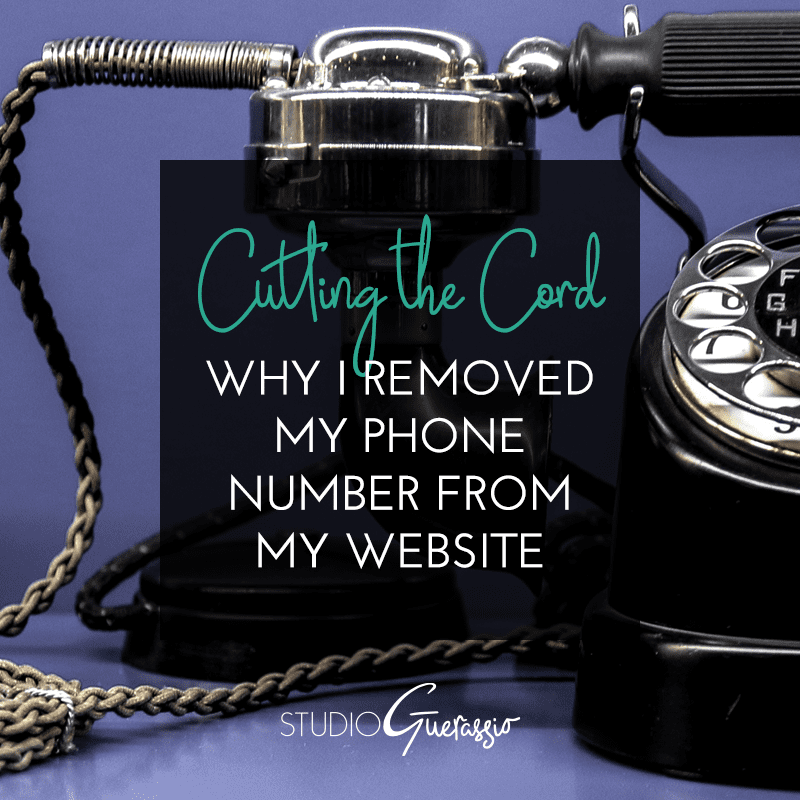 Even though I’d made it very clear that email was my preferred mode of contact, I still had leads call me and leave messages with nothing but a phone number as a way to get back in touch. Thing is, that would tell me straight away that we weren’t going to be a good fit to work with and then I’d have to fit a phone call back to them into my schedule to tell them that. Not that it would take a long time, but like you, I really dislike unnecessary phone calls. So I just cut out the problem altogether. Yes! I would get that, too – just voicemails with nothing but a name and number, with no idea what kind of business they ran or what kind of project they wanted to talk about. Also served as a red flag for me. Now I try to funnel all initial contact through the form on my contact page; that has all of the questions I’d need to ask anyway, and if they don’t want to fill that out, then also probably not a good fit to work with me.